It did not take much time to spread the news in Malabar, through Arab merchants, about the emergence of a prophet named Muhammad (peace be upon him) in Makkah and his religion, Islam. When the moon was split into two as a miracle from Prophet Muhammad, many people inside and outside the Arabian peninsula had witnessed it. Cheraman Perumal Rama Varma Kulashekhara was said to be the king of Kerala at that time. He saw the miracle while he was relaxing on the rooftop of his palace in Kodungallore in a moonlit night. The king had come to know about Islam through Arab merchants and became more curious to know about the Prophet and his religion after the moon-splitting incident. Luckily a group of Arabs came to Kodungallore at that time, met the king to get permission to visit Ceylon, the present Sri Lanka. They wanted to visit the mountain which has the footsteps of Adam, the first human being and the first prophet. King Cheraman asked his Arab guests about the miraculous moon-splitting incident. Sheikh Sahiruddhin bin Baqiyuddhin Al-Madani, a prominent member of the team replied: “We are Arabs, we are Muslims. We have come here to visit Ceylon.” The king became more curious to hear about Islam directly from the residents of Madinah, the center of Islam and the first capital of the Islamic government. Sahiruddhin gave convincing reply to all the questions asked by the king. Cheraman then expressed his desire to embrace Islam and travel with them to meet the Prophet. This incident is well documented by M. Hamidullah in his book “Muhammed Rasulullah,” William Logan in his book “Malabar Manual” and Ahmed Zainudhin Makthum in his work “Thufhathul Mujahideen” as well as in the interview with Raja Valiya Thampuran of Kodungallore. Before going to Makkah, the king divided his Kingdom into three parts and appointed his sons and nephews to rule each province. He also visited many of his relatives and employees to give them instructions. He went to Kalankara to see his sister Sreedevi and told her about her decision to visit Makkah and embrace Islam. His nephew, son of Sreedevi, was appointed to rule the present Kannur district. He later embraced Islam and became Muhammed Ali, who established the Kannur Arakkal royal family and became the first Adiraja. King Cheraman declared his conversion to Islam in the presence of the Prophet and adopted a new name, Thajuddin. He later performed Haj. As per the wishes of the Prophet, a team of his companions led by Malik bin Dinar started their journey with Thajuddin to propagate Islam in Kerala. But along the way the king fell sick. Before his death the king had written a letter to his sons to receive Malik Bin Dinar’s team and to give them all necessary help. The king later died and buried in Zafar (now Salalah) in Sultanate of Oman. After landing in Musris (Kodungallore), Malik Bin Dinar met the ruler of the area and handed to him the king’s letter. The ruler made necessary arrangements for them to propagate Islam. 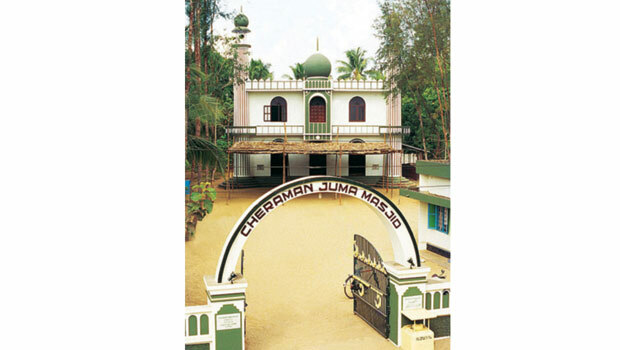 Some history books say that a temple named Arathali was converted to a mosque and named after Cheraman in Kodungallore. Bin Dinar and his colleagues built mosques in 12 places. Surprisingly all of them are situated along the coastal areas of Arabian Sea. Bin Dinar died when he was in Butkal, Karnataka, and was buried there. It is mere coincidence that King Cheraman and Bin Dinar were buried on the two banks of the Arabian Sea: Salalah and Butkal. Three conditions are to be fulfilled for a person to become a Sahabi or companion of the Prophet. First, he should embrace Islam from the Prophet or from his companion, second, should spend at least a small period of his lifetime with the Prophet, and third, should die as a Muslim. Cheraman fulfilled all the three conditions and can be said that he was the only Sahabi from Kerala, known to history.